The Blackwell Trader MetaTrader 4 Mobile Apps allow you to access your trading account at a time and place that suits you, wherever you are. Using one of our Forex trading Apps you can view your account history, check your trading activity and place or execute trades in your Forex trading account, whilst you are on-the-go. Using the Blackwell mobile Forex trading app you can access the Forex, Spot Metals, and CFDs markets, via Android and IOS devices and trade from wherever you are connected. Our Forex Mobile Apps are available in 10 different languages and our MT4 mobile platform comes fully equipped with features that will be familiar to users of our MetaTrader 4 client terminal. That means you can trade intuitively, on your chosen device, and benefit from the security and convenience offered by our mobile trading apps. Whatever your location. Access and trade on Demo or Live Forex trading Accounts. Take the markets with you, wherever you go. Trade more than 60 currency pairs alongside spot gold and silver, plus a range of CFDs. 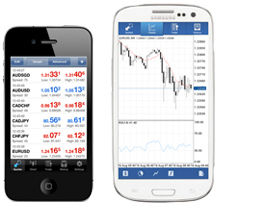 Stream Live Forex quotes to your mobile phone or tablet device. Review your account status: Easily check your P&L, equity and margin balances. Blackwell Global’s mobile trading apps are available in 10 languages. Stay on top of the markets and your accounts. Easily monitor any changes as they happen, track open Positions, Pending Orders, Balances and Free Equity and more.